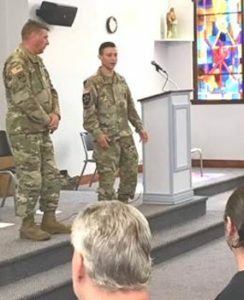 United States Army Recruiters Sergeant First Class Michael Mitchell (left) and Sergeant James E. Bogacki visited the St. Ann Substance Abuse Program (SAP) to give a brief presentation on the qualifications that need to be met to enlist in their branch of the service. All in-house clients attended the presentation and several of the men stayed after the presentation to ask questions. Water bottles with the Army logo were given to all attendees.